April wasn't the best month for me because a lot of unfortunate things happened to me (i blame Mercury in Retrograde) so I wasn't able to complete most of my April goals. I pretty much completed all of my lifestyle goals but wasn't able to accomplish either one of my blog goals. It's a new month though which means it's time for a new set of monthly goals! This was one of my goals from April but I wasn't able to complete it so I am going to try again this month. I actually have 2 weeks of May planned already so as long as I remember to schedule and publish them in time I should be good. I have always wanted to participate in one of those Instagram photos challenges but I'm always scared that I won't be able to accomplish this goal. However, I decided to just take a gamble and try anyways. I have several pictures saved on my phone ready to be posted just have to wait to post them. I'm not really confident that I will succeed with this goal but who knows I may surprise myself! I am guilty of indulging past midnight hours which isn't the healthiest habit because that means unnecessary fat gets stored in my body whilst I sleep. To avoid this I am going to try to stop eating heavier meals after 8 pm. When it comes to buying food I am the worst. I try to buy healthy food but I'm very lazy when it comes to cooking and tend to go for processed ready-to-eat microwaveable meals that don't require that much time. These meals aren't that cheap either because I buy the vegan and vegetarian versions that tend to cost more. So I am going to try and not buy those frozen meals and instead buy food that is not only more affordable but also healthy. If any of you have any tips I would really appreciate it. We have a treadmill that's been sitting in my parent's room for years. A couple years ago I would use it every day but then the conveyor belt slid to the right side of the treadmill and I just left it there. I've tried to fix it myself but have failed miserably. Hopefully, my dad can fix it but if not looks like I will continue to count on HIITs to count as my cardio. I've got to try not to eat past 8pm too, but it's difficult as Daniel works nights and he is the cook at home. We try to eat dinner before he leaves, but it's not always possible. 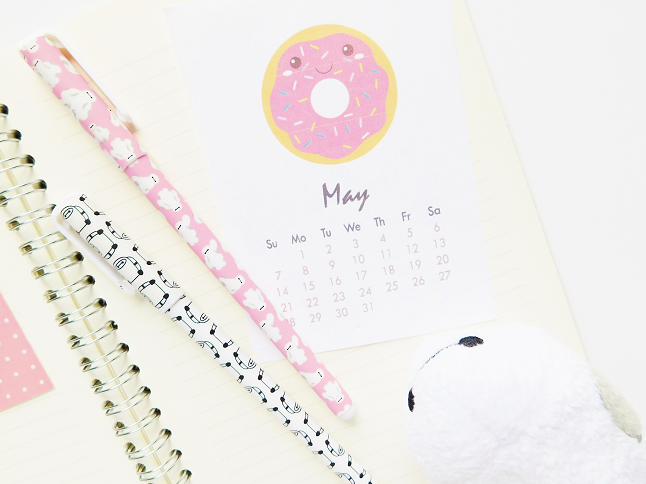 I'm sure with a bit more planning we'd be able to get into a better routine though ☺️ Also that donut calendar page is too cute! Donuts are my fave. I agree quality over quantity but I just want to see if I can see a difference with my views and followers if I were to post a Instagram photo a day.